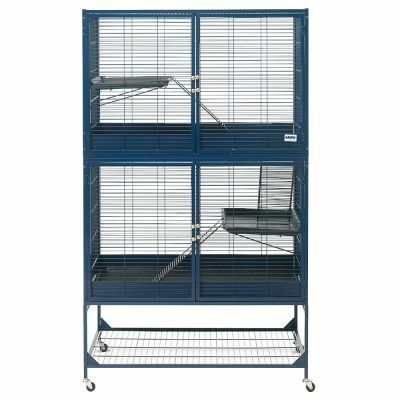 Sturdy and spacious :"Bought this for our rats. It is very spacious and the boys seem very happy with it. One of the wheels was the wrong type and couldn't be attached to the cage. The customer service was quick to reply t"
This luxurious cage provides your pet with a perfect home! This cage was designed according to the wishes of owner and pet. The complete front can be opened to allow easy replenishment of food and cleaning of your pet's cage. The additional level gives a lot of extra space and freedom to move about. The entrance to the top level can also be locked in the case of your pets needing to be kept separate when ill. The supporting legs of the cage have 4 rollers attached, making it simple to move the cage about. It gives you the space to carry out essential daily maintenance like feeding, changing the hay, etc. The wire mesh is in a dark navy-blue that doesn't just look great, it also is incredibly durable and robust. The Savic Royal Suite comes with 2 additional levels and ladders. This product cannot be delivered to Switzerland or Austria. Bought this for our rats. It is very spacious and the boys seem very happy with it. One of the wheels was the wrong type and couldn't be attached to the cage. The customer service was quick to reply to this problem and the broken bottom pan. Sturdy which is good because we have a dog who sometimes pokes the cage. Wasn't the easiest to assemble and fell apart a few times, but the result is worth it. Being able to be separated into two parts is good just in case. My three boys absolutely love this cage. Zooplus let us down a bit with the very lengthy delivery (4 weeks) but once it arrived all was well. After I ordered it on the 10th of May it finally arrived on the 23rd well over what was promised! That being said it arrived perfectly it took my and my boyfriend about an hour to build and luckily he’s a strong guy and was able to push and bend all the various bars and corners that fit some reason were not lining up just right. My three male rats are beside themselves, they have to idea what to do with all this space! I’m beyond happy for them now and this is why I’d recommend this cage! Absolutely love the cage. Fantastic price for a high quality cage. Bought for 4 rat boys. box arrived in perfect condition and all content was perfect . I would recommend to a friend both the cage and Zoopla highly . Brilliant cage, my new chinchilla is very happy and has loads of room to run and jump around! The cage was a little tricky to put together, and it would have been easier with two people. The cage was shipped from Germany to the UK and the box was pretty bashed up, and there was also a little cosmetic damage to the cage. I think some of the negative reviews are based off damage caused in transit, the cage itself when undamaged is super high quality and probably the best you can get for the price. The cage itself once assembled is fantastic ! Lots and lots of room for toys and hammocks so I'm sure the rats will LOVE IT !! My only issues were with the building of it. Some of the drilled holes did not match up so my grandpa had to drill through some bits himself in order to screw the cage together. The little black plastic squares that block the holes on the top 4 corners were non existent apart from one and a few broken pieces in the packaging. Luckily these aren't important but for something at £199 I expect everything to be present, perfect and not broken ! This cage is likened more to a palace for my rats- they absolutely love it, access is great, it's strong and sturdy. However one flaw as already mentioned by a previous reviewer is the depth of the trays- they are just not deep enough and substrate falls out daily onto the floor. Easily remedied by a quick hoover but it really would be perfect if Savic could fix this. I am also going to take the middle section out to create more room to put toys/hamocks in, and also allows for more exercise. 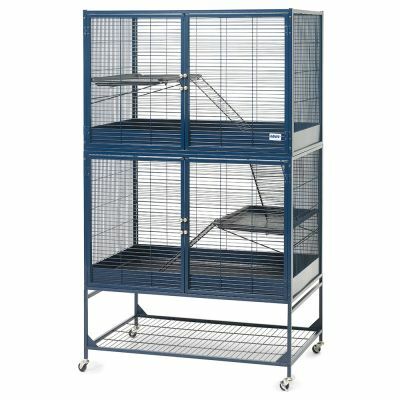 I got this cage for my 3 rats and it really is great apart from the trays which aren't deep enough. I have had to stop using substrate and start using fleece as the mess was driving me crazy! The cage is huge so you really need to make sure you have space for it. It's really well made and sturdy and heavy to move even on the wheels. The top and bottom sections can be cut off from each other which is handy for cleaning out. Overall I am really happy with this cage, just wish it had been available in different colours! After having a Jenny and a Ferplast Furet Tower for my ratties I finally got round to ordering this, and I don't regret it!!! Great size, and as it opens up totally I can actually get into it without injuring myself! Ratties love it, I love it. Brought this cage to give my chins some more room and they love the extra level and the fact that one level is bigger than their original cage is just a bonus.I must admit when I first got the flat pack I thought they'd sent me a flat packed baby elephant due to the wait and I did stare at the pile of parts for a while before I managed to get started but it got a lot easier when I did. Shelves are plastic they are very robust and my Chins haven't managed to even nibble a small chunk out. Bought another one of these because they are so good, the plan is to extend our original one into a triple cage and keep the top part as spares. I spoil my rats so much but having the extra level will make a big difference. What a great service from zooplus, my number 1 go to website. Beautiful cage and my ratties love it, easy to put together and very well made. Everyone that owns rats should get one of these, getting so much pleasure out of it and so are my rats. Some have mentioned the bottom tray not fitting, yes there is a slight gap but none of my cardboard bedding has fell out, it's a very small gap and should in no way put anyone off. The best rat cage in the UK !! Fantastic cage, great size. Assembly took me about 2 hrs, a couple of screws had poor heads on them and I had to use pliers to twist them in, but other than that it was fine. Just take your time when building and make sure you are 100% sure you have the right part put in before screwing it in, its easy to make mistakes if you rush it. I got this cage for my 2 rats, only downside is that when they were young (6/8 weeks old) they were able to get out of the very top of the cage. I resolved this by placing a grate over the top, so they could still see out but not get through.The spacing is a bit larger (half inch) on the top for some reason, but the rest of the cage kept my ratties contained. If you are wondering about building only half the cage (and fully build later) this is possible! So you use the top section on the bottom. 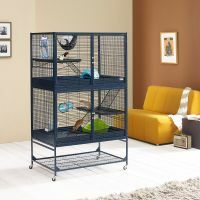 This might be desirable for someone who has the cash to spend on high quality cage but doesn't need the full size yet. Another question that might come up is can you separate the cage into 2 sections? (like having males on females in the top section and males in the bottom section) Short answer; no, long answer Yes! It is possible to close off the 2 levels but you would need put your own grate at the mid level, a cheap alternative is to switch the base around, so the part that has the 'hole' to allow movement between levels would be swapped around to an area that is grated, but you run the risk of the base being chewed through to the top/bottom. Some people have talked about their pets chewing through the bases which are made of plastic. I fortunately haven't had this issue, but I did see a women on youtube who contacted Savic and they provided the model number for another base they supplied which was double thickness, so it is possible to get replacements in the event your pet chews the base. Outer box arrived in a quite a state and I feared for horrendous damage inside, especially the trays. Nothing to worry about though, all perfect. Took me and a 10 year old girl an hour and a quarter to build. We made a school-boy error on the way, fitting the upper doors where the lower doors should be, but the instructions were very clear and easy to follow. Minor niggle - a couple of the allen screws were not finished properly which means they are only hand tight and couldn't be screwed in. No biggie for me; I just swapped those round to less important places. Overall: just fantastic. It's really huge and really solid. Daughter's rats will LOVE it. I have split my SRS into 2 and keep 4 does in the top half and 3 bucks in the bottom. To do this it's recommended to get something substantial to place on top of the middle divider (such as a metal tray) as the bars are wide, small rats can easily squeeze through and the plastic trays are quickly chewed. There is plenty of space in each section for lots of toys, litter trays, wheels etc. The massive doors are great, they allow for easy placement/attachment of toys and quick cleaning out. Took me around 45 mins to build by myself and was pretty straightforward. Just make sure to use the narrow bar spaced divider as the roof; I had to swap it around as I used one of the wider bar-spaced shelves first time! My only problem with this cage is that the trays aren't deep enough and substrate is easily kicked out, drops down the sides of the trays and through the shelf bars onto the floor. I have to Hoover around the cage every day as a result of this and will be looking into getting some deeper trays as replacements. This is the only reason my rating lost a mark but I would have given 4 and a half if I could have. 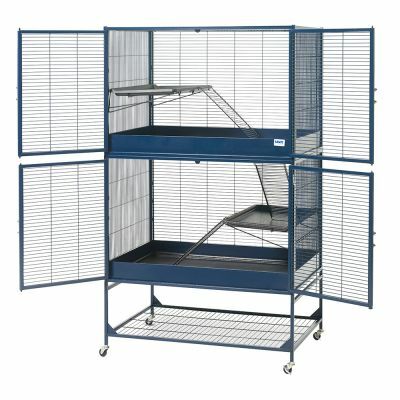 Absolutely huge cage perfect for my ferrets. The cage was incredibly easy to put together and I am very impressed with the quality and design. The cage was delivered quickly. Only thing that I am disappointed with is that one of the back panels came with deep scratches all over it, which is why I have given 4 stars. Which is more of a postage and packing issue. As for the cage I cannot recommend it enough!